It’s bad news in the Marvel U. this week, as the Infinity event begins! Reality is breaking down, half the Avengers are fighting a war in space, and worst of all, Thanos is back! Meanwhile, Wonder Woman comes to Smallville, Saga continues and Buck Rogers returns from the 25th century, all in this week’s comic releases! • Halo: Initiation #1: The origin of ODST (Orbital Drop Shock Trooper) soldier Sarah Palmer and the Spartan IV program. • Resident Alien: The Suicide Blonde #0: An alien disguised as a small-town doctor must investigate a murder with the one person who suspects his extraterrestrial origins. • Other releases: Breath of Bones: A Tale of the Golem #3, Buffy the Vampire Slayer Season 9: Freefall #24, Star Wars #8, The True Lives of the Fabulous Killjoys #3, X #4. • Smallville Season 11 #16: A certain Amazonian princess makes her Smallville debut while searching for her missing mother and queen! • Batman #23: Bruce Wayne becomes Batman as Scott Snyder’s “Zero Year” continues. • Justice League of America #7: The secret of the Secret Society is revealed. • Other releases: Astro City #3, Batgirl #23, Batman: Arkham Unhinged #17, Batman: Lil’ Gotham #5, Constantine #6, Demon Knights #23, Django Unchained #6, Green Lantern Corps #23, Katana #7, Nightwing #23, Suicide Squad #23, Superboy #23, Threshold #8, World’s Finest #15. • Thunder Agents #1: The time-traveling Silver Age heroes are back — but they won’t be for long if a new recruit can’t rescue the team from Iron Maiden (not the band, unfortunately). • My Little Pony Cover Gallery #1: 32 pages of nothing but My Little Pony comic covers. • Other releases: 100 Penny Press: Star Trek #1, Doctor Who Vol. 3 #12, Doomsday.1 #4, GI Joe Special Missions #6, Half Past Danger #4, Star Trek #24, The X-Files Season 10 #3. • Saga #13: It’s back! Hazel and her family head to Quietus to search for author D. Oswald Heist, but the trip will be anything but quiet. • Ghosted #2: Jackson Winters’s team of paranormal agents must capture a ghost from a house that dismembers its inhabitants after dark. • Other releases: East of West #5, Great Pacific #9, Lost Vegas #4, Mind the Gap #12, Peter Panzerfaust #13, Savage Dragon #190, Spawn #234, The Walking Dead #113. 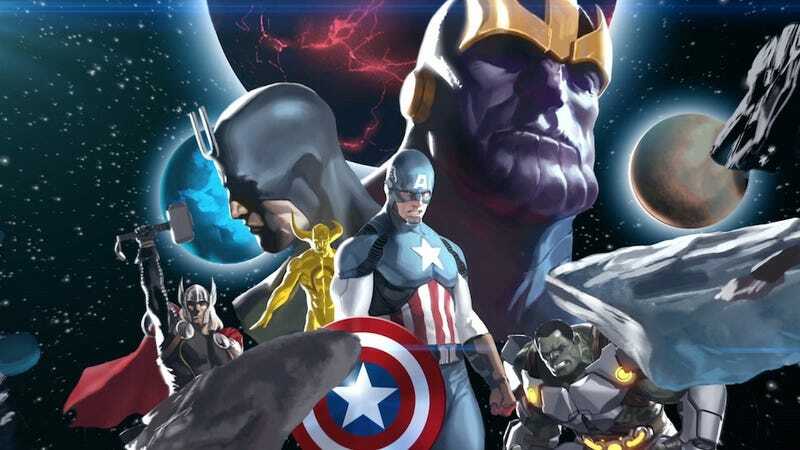 • Infinity #1: Thanos returns as war breaks out on Earth and in space in Marvel’s new event. • X-Men: Battle for the Atom: The X-Men of the future come to the present to force the All-New X-Men — the young, original X-Men of the past — to return to their own time. • Wolverine #8: Wolverine finds a cure, but it’s in Wakanda — and he won’t exactly be welcomed as a friend (mostly because he boned Black Panther’s ex-wife Storm). • Other releases: Astonishing X-Men #65, Avengers Arena #13, Deadpool #14, Fantastic Four #11, Fearless Defenders #8, Marvel Universe: Ultimate Spider-Man #17, Scarlet Spider #28, Secret Avengers #7, Superior Spider-Man Team-Up #2, Thor: God of Thunder #11, Ultimate Comics X-Men #30, Uncanny X-Force #10, Uncanny X-Men #10, Wolverine and the X-Men #34. • Buck Rogers in the 25th Century #1: the legendary Howard Chaykin returns to draw the classic scifi hero over 80 years since his newspaper debut. • Fubar: By the Sword #1: This over-sized issue contains, and I quote, “Ye olde zombie-stomping madness“. Can’t go wrong with that. • It Came #1: This comic homage to B-movie madness features a very British giant robot, politely laying waster to the English countryside. • Other releases: A1 #3, Adventure Time: Candy Caper #2, Archer & Armstrong #12, Battlestar Galactica #3, Charismagic: Death Princess #3, Chronos Commandos: Dawn Patrol #2, Damsels: Mermaids #4, Deathmatch #8, Dejah Thoris and the Green Men of Mars #5, Grimm Fairy Tales: Demons Unseen #3, Grimm Fairy Tales: Wonderland #13, Gold Digger #202, Grimm #4, Harbinger #15, Herobear & the Kid: Inheritance #1, Last Zombie #3, Red Sonja #2, The Shadow/Green Hornet: Dark Nights #2, Six-Gun Gorilla #3, Steampunk Corsairs #1, Supurbia #10, Vampirella: Southern Gothic #1, Watson and Holmes #2. • Ex-Sanguine: An ancient, weary vampire is newly inspired by a mysterious murderer called the Sanguine Killer. • Other releases: Battlepug Vol. 2, BPRD: Hell on Hearth Vol. 6: Return of the Master. • The Flash Vol. 2: Rogues Revolution: The Flash’s foes band together, but their object isn’t the Scarlet Speedster, it’s Captain Cold. • Right State: A political thriller about an ex-Special Forces right-wing pundit tries to stop an American militia trying to assassinate the second African-American president. By Incognegro’s Mat Johnson. • Other releases: The Flash Vol. 1: Move Forward, Nightwing: Old Friends New Enemies, Smallville Season 11 Vol. 2: Detective. • Transformers 30th Anniversary Collection: The greatest Transformers comics of the last three decades, from Marvel to Dreamwave to IDW! • Xenozoic Tales Artist Edition: After centuries spent underground, humanity emerges from the caves to discover the world is overrun by beasts and monsters. • Other releases: Amelia Cole and the Unknown World, GI Joe Vol. 1: Homefront, Kiss Solo, My Little Pony Digest Vol. 1, Thunder Agents Classics Vol. 1, Transformers: Dark Prelude, Zombies Vs. Robots: Diplomacy. • One Trick Rip-Off: Deep Cuts: Two young lovers try to rip-off a brutal street gang and escape the city. This volume contains the Supetrouble manga Paul Pope released in Japan. • Other releases: Frank Cho: Women: Drawings & Illustrations Vol. 2, Invincible Compendium Vol. 2. • Avengers Assemble: Science Bros: While trying to rescue one of the Marvel U.’s other smartest men, Iron Man and the Hulk fight a 20-million-year-old evolutionary catalyst and give each other grief. • Alpha: Big-Time: Even though Spider-Man told him to stop, young alpha is more determined than ever to become a hero. • First X-Men: The secret pre-history of the X-Men is revealed. • Other releases: Dr. Strange and Dr. Doom: Triumph and Torment, Essential Fantastic Four Vol. 9, Fearless Defenders Vol. 1: Doom Maidens, Wolverine Vol. 1: Hunting Season, X-Force: Phalanx Covenant. • What Is Above: The fourth volume of Moebius and director Alejandro Jodorowsky’s The Incal, the best-selling comic masterpiece. • Bad Break: A tattooed sailor holds the key to a surprising treasure, but there’s a problem — he’s been dead for quite some time. • Other releases: Best of Archie Comics Vol. 3, Blue Morning Vol. 2, Dorohedoro Vol. 10, Embracing Love 2-in-1 Vol. 1, Excel Saga Vol. 26, Grimm Fairy Tales: Jungle Book Vol. 2: Last of the Species, Golden Age Greats: Spotlight Vol. 13: Centaur Chronicles, Inuyasha Vizbig Vol 16, Itsuwaribito Vol. 9, Knights of Sidonia Vol. 4, The Little Prince Vol. 10: Planet of Trainiacs, Magi Vol. 1, March Book 1, Neon Genesis Evangelion 3-in-1 Vol. 4, Otto’s Backwards Day, Tiger & Bunny Anthology Vol. 1, Travelin’ with Mr. Toast and Friends, The Wallflower Vol. 31.